Canada's answer to the NRA is celebrating Christmas this year with an ad that features Santa giving a child the same weapon used in the Sandy Hook school shooting. The image has been shared this week from the National Firearms Association's Facebook page and by its executive vice president Shawn Bevins on Twitter. The "no compromise" slogan positioned beside Santa is a longstanding NFA tagline that refers to the group's goal of repealing the gun-control legislation passed in the wake of the Montreal Massacre. "Don't shoot your eye out kid!" is a reference to the 1984 film a "Christmas Story" in which a young boy wants a BB gun for Christmas. Little Ralphie's family tells him he can't have the rifle he wants because he'll shoot his eye out with it. On Christmas morning, Ralphie get the gun from his father and promptly almost shoots his eye out. The film ends with Ralphie lying in bed cradling the gun he so desperately wanted. The weapon featured in the NFA ad is not the Red Ryder BB rifle that Ralphie almost loses his eye for, but a Windham AR-15. The type of weapon is clear because it was identified by the NFA itself in a Facebook comment. 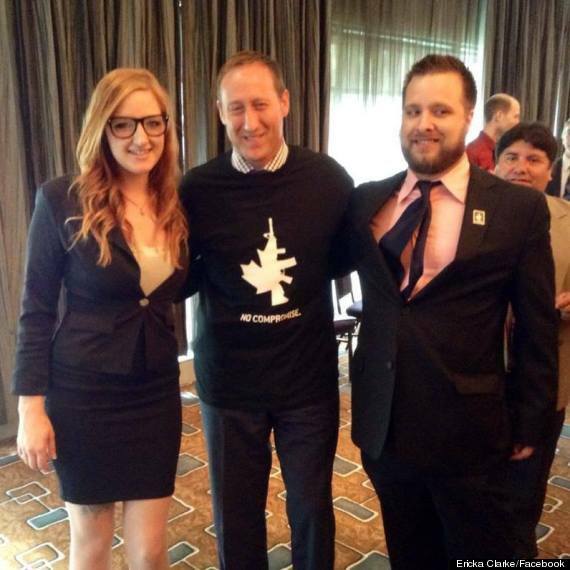 A gun that looks a lot like the AR-15 was also featured on an NFA T-shirt that landed Justice Minister Peter MacKay in hot water earlier this year. The AR-15, which is manufactured by a number of different companies, is the semi-automatic version of the U.S. military's M16. Sandy Hook gunman Adam Lanza used an AR-15-style Bushmaster semi-automatic rifle when he shot and killed 20 children and six adults in December of 2012. Lanza's mother Nancy, a gun enthusiast, often took her children to gun ranges. She wrote Adam a check to buy a pistol as a Christmas present in the days leading up to the mass shooting. On Dec. 14, Adam murdered his mother while she lay in bed before travelling to the Sandy Hook elementary school and killing 25 others. The AR-15 is a restricted firearm in Canada and is therefore very difficult to acquire, something the NFA would like to change. Earlier this year, the group publicly argued that the murder of three Mounties in Moncton was evidence that Canada's gun laws are "excessive." The question of whether children should be given access to guns made headlines earlier this year when a 9-year-old girl accidentally killed her shooting instructor with an Uzi. Guns are regularly marketed to children in the United States. Keystone Sporting Arms has a specific model, the Crickett, which it markets to kids. Ads for the weapon feature a cartoon cricket and the company even makes a pink version aimed at girls. Last year, a five-year-old boy in Kentucky shot and killed his two-year-old sister with the Crickett rifle he received as a birthday present. Sixty Canadians 19 years of age and under died in firearms-related incidents in 2011, according to Statistics Canada. The vast majority of those deaths, 42, were the result of suicide.